Audi has released teaser images of the new E-tron GT four-door concept ahead of its reveal at the Los Angeles motor show this week. The new images of the electric sports car, which is due in 2020, include it sporting a livery similar to that used for the e-tron SUV ahead of its reveal earlier this year. They provide the clearest look yet at the four-door coupe ahead of its appearance in LA tomorrow, although no further information was released. The production version of the E-tron GT will have a similar range to the new E-tron SUV but be “focused more towards power”, according to the firm’s powertrain boss. The E-tron SUV offers a 248-mile range measured on the new WLTP test and Siegfried Pint told Autocar the GT will achieve a similar number. But he added that the vehicle will be “steered towards performance”. In the most powerful boost mode, the E-tron has a claimed 0-60mph time of 5.5sec, with a top speed of 124mph. By comparison, the rival Tesla Model S P100D has a 0-62mph time of 2.7sec and a 155mph top speed. 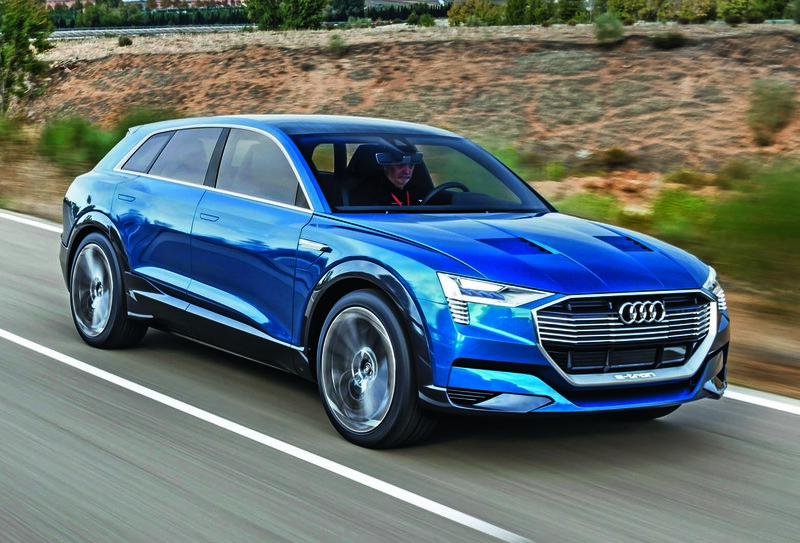 It is understood that Audi will endeavour to make the E-tron GT beat those figures. The E-tron GT will be built on the same J1 platform as the Porsche Taycan EV that will be launched next year. Audi technical development boss Ulrich Widmann said the E-tron GT will “get some genes from Porsche and add a lot of Audi genes”. The E-tron GT will be the first electric model in the E-tron range to get a ‘flat-floor solution’ rather than the ‘high-floor solutions’ seen in the E-tron and upcoming E-tron Sportback, Widmann said. The model will also be the first Audi EV to allow for 350kW fast charging, according to product manager Johannes Eckstein. That means it will be capable of charging to 80% in under 12 minutes. Audi first confirmed plans for the electric four-door car in March – two years after Autocar had scooped the model – at the company’s annual press conference. Audi has also described the upcoming four-door as “highly dynamic” and said it showed the direction of the company’s performance division. The E-tron GT will be produced at the firm’s Neckarsulm factory in Germany. It is one of 10 Audi electric models that are due before 2025. Good to see talk finally translating into reality. Hopefully Audi can produce this in numbers larger than the Jaguar I-Pace. Auto(car)correct: There are three versions of the Model S: the 75D, the 100D and the P100D. They are basically quick, very quick and "ludicrously" quick. I think the 0-62 time you quote is for the 100D. The only way it would take the P100D 4.3 seconds is if it was towing a caravan up Big Ben. Having clarified that, I do hope BEVs don't become bogged down in a 0-60 willy-wagging contest à la Nurburgring. I would prefer efforts to a) reduce price b) increase range and c) maximise packaging advantages. Speed, high speeds , 0-60mph, 0-100mph and so on will not matter soon because they are so easy to attain, so a Tesla will hit 60mph in under two seconds!, soon get tired of that party trick won’t we?, ironically, Tesla could start the decline of the Motor industry......? ....ironically, Tesla could start the decline of the Motor industry......? Yikes, Tesla were meant to be going bankrupt last month, next they're get blamed for BREXIT and Trump. Tesla could start the decline of the Motor industry......? Actually, I think it will be the other way round, as EV buyers relaise they dont have to compromise when buying one, or worry about aftercare as the motor industry have dealers in every town and Tesla have approximately 20 "stores" in the whole of the UK, with over a third of them in London, which is great if you live in the capital, but pretty piss poor if you live anywhere else. How many of these offer full dealership facilities, I have no idea..
Tesla P100D "0-62mph time of 4.3sec " you can knock 1.5 seconds of that, but then the VAG product wouldn't look so advanced. ..this is from a company that struggles to make a competent ICE. VW were trying to buy out tesla so I don't know what all this is silly "more power" sentiment is all about, this is about not killing the planet primarily...ridiculous. Not certain why you chose to reply to me with facts that are untrue, the best selling car in the world for the last 3 years has been the Toyota Corrolla before that it was the Ford F-150 in 2015 2014, 2013, was the best seller. Everyone can have their own opinion but not their own facts.